I got my grubby hands on this book, and well, what can I say about it? First, that my poor DMG1 will go off to the back of a shelf somewhere, never to be seen again. This book makes my DMG completely irrelevant. And it does the same for the non-classes portions of the PHB1 as well. And since I have DDI, well, that book is now irrelevant too. A lot has been said about Essentials, and for the most part I’ve stayed out of the whole thing. I’m not going to give an opinion about things I haven’t really seen. But now that I own the Compendium, guess what? I’ll give an opinion. It’s 4e. It’s the same exact game. The rules are the same, but presented in a better way. The first thing that stood out was the format of the book. It’s a 6×9 softcover, reminiscent of an indie game or something similar. I love this format, especially for a book that’s meant to be flipped through over and over again at the table. This book is a must at your table, do not underestimate how useful it is. So I’ll give an example of how some content’s presentation has been updated. Lets look at Skill Challenges. Skill Challenges are the same, they range from a complexity of 1 through 5, same number of successes vs. failures, but they add a few new things to the presentation of it. Now, the Skill Challenge table shows what kind of checks you should be using when designing Skill Challenges of varying complexities. 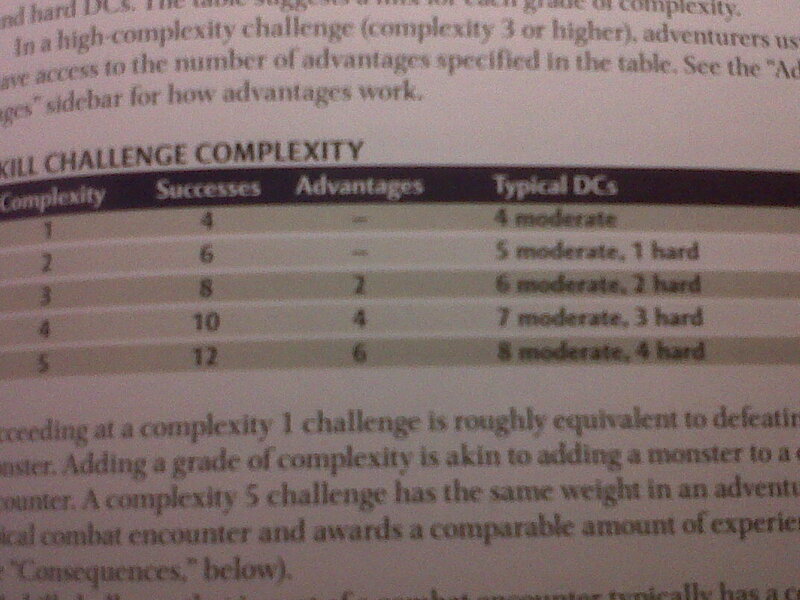 So for example, a complexity 1 Skill Challenge will typically be made up of 4 moderate DC’s, while a complexity 4 (10 successes) will be made up of 7 moderate and 3 hard DC’s. Having this info at hand makes designing the mechanics of a Skill Challenge a little easier. They’ve also added something to the design of Skill Challenges: advantages. I’ve never seen this mentioned before, so I’ll assume it’s new to the Rules Compendium. Advantages are meant to be ways that the party can gain an upper hand during high complexity (3+) challenges. They present four advantages, and state that “for each success beyond 6 required in a challenge, one of the following advantages should be available. An example advantage would be “A success against an easy DC counts as a success against a moderate DC”. It seems they’ve tweaked Skill Challenges, yet again, and made it easier for a party of adventurers to succeed on higher complexity ones. Another neat thing I found in the book was in the skills section. Each skill now includes a sidebar with ways that a creative player may want to use that particular skill, and the DC type involved. So for example, the Religion skill can be used to “Soothe grief-stricken or panicked peasants by chanting a hymn (hard DC)”. This falls under the idea that although 4e has a limited skill selection when compared to its predecessor, the skills are usable if the player gets creative, and the Rules Compendium shows that. There are also a whole bunch of charts now. There is a random element to the treasure parcels, and interestingly enough the term “treasure parcel” isn’t used. The much talked about magic item rarity rules are in here as well, and yes, whether a party finds a common or rare item is a random roll as well. So in closing, this book is a must not only if you are going to be running Essentials-type 4e, but regular 4e as well. All the errata has been incorporated, (I finally understand mounted combat) and it is laid out in an easily absorbed manner. I highly recommend picking up this book, and putting away the good old DMG and PHB1’s that you have laying around. You had me at “charts”! Rolling up imaginary hordes of treasure is about as cherished a childhood memory as I have. (I may have rolled dice on more randomized tables than I ever rolled in an actual game.) Thanks for this early review! Thanks for this post. After reading it this afternoon, I called the FLGS and had them hold the last one that they had in stock. Showed up and found that they had one copy of the Heroes of the Fallen Lands book left also. Great books and at $20 each, they far surpass the expectations I had when getting back into D&D. While I love the idea of a concise book compiling all the errata and changes between covers, I feel for the guys holding tons of the first run 4E books in their stores. I’m seriously wondering if next year WotC will roll out a ‘second printing’ of the PHB, DMG, and MM incorporating much of the errata. That might find an audience (but I suspect a lot of ire also, especially from merchants). I guess it comes down to how much WotC has printed out and the current stock of books warehoused. I’m torn a little with essentials. It looks like the Red Box might be a great way to introduce folks to D&D. The Essentials Rule Compendium seems great. The DM kit also looks like a great product for the aspiring DM with a lot of counters and maps. But I’m also getting the vibe that many things in essentials are bleeding over to the original books. I get it. Why release just product for just the new player? Why not also release material an established player would want also? So you have a lot of new options, which is all backwards compatible, and product that will move for both the new and ‘old’ 4E customer. But while WotC had been chiming essentials is totally optional, I see a few things becoming the standard. It’s not a big deal. After all you can completely ignore any errata and mechanical changes that are being thrown out there. But if folks keep in that camp, you are going to run into some friction between the people that want the most up-to-date material, and those that don’t want to bother. I worry next year when you get a bunch of guys that started with the 4E launch and those starting with essentials mixed in together, stuff might get a little muddled. Yeah, at this point I don’t trust WoTC enough to want to purchase another book from them that will be errata’d out of usefulness. And who’s to say they won’t do that to the essentials books either? They need to playtest their product and stick with what they print. Otherwise, offer .PDFs with a book purchase that gets free errata update to the PDF. I’m still playing with my 1987 Red Box because I was mad that TSR changed the rules and published new books and called it D&D. Seriously though, I don’t get the backlash. RPGs evolve and are the better for it. Great review! I picked up the new Red Box yesterday and hope to run a game or two for my kids this weekend. I’m definitely going to buy into the Essentials line. Speaking of which, is the compendium already out? Preferred stores starting selling it on Sep. 10th, while all other stores begin selling it on the 21st. Preferred stores are those that WOTC classifies as such for actively promoting their products. Great review, and glad to see that you’ve pointed out a very crucial distinction about this book. It’s a compact 4e rulebook, and a very good one at that. It isn’t something simplified for Essentials, and it’s in a fantastic format for quick table reference for any 4e game. Pre-ordered Heroes of the Fallen Lands & The Rules Compendium. They can’t get here fast enough. I’ve been working slowly on a new campaign that I want to run using the essentials gear. 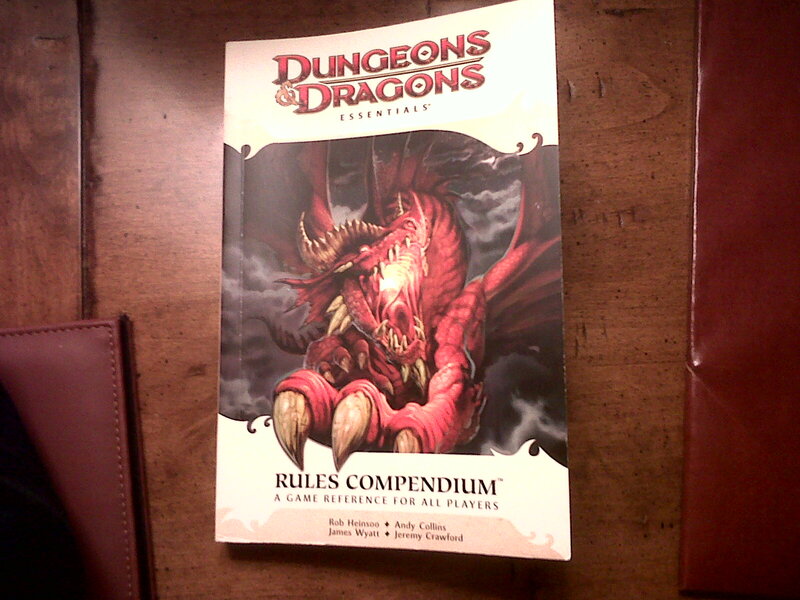 So does the rules compenium contain 100% of the information in the DMG1, including advice and ect., because I’m torn between getting the DM’s kit or this first. 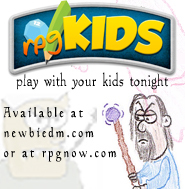 (not both) I already have a fully updated PHB1, but no DMG. Well, I hate you, now I want to buy this book ASAP. Neh, I dont hate you. I really like your reviews and your “flipps through” some books, cause then I know how good or bad are they. Excellent review. Shame that my DMG1 and PHB1 are obsolete though. Great review, I thought about picking one of these up. Excellent review. I liked the smaller size, too. It’s easy to throw in a backpack and take to D&D Encounters and other RPGA games, making it the only book I need to take to run such games. And the price is GREAT! I have the book too and love it from flipping through it so far. Will be using it as DM next week!